Well, I arrived in Vegas this morning just as quick as I could get here, my purpose being to cover the National District Attorneys Association’s Conference on Narcotics and Dangerous Drugs…oh, hold a minute…sorry, that was Hunter S. Thompson. I’M here for the IBM Impact 2012 event being held at the Venetian Hotel and Casino (which is NOT to be confused with the Venice that’s located in Italy and which is slowly succumbing to the seas around it). No, this Venetian doesn’t have that particular problem to worry about. The next four to five days, depending on the length of your stay and the size of your bank account, is going to be entirely dedicated to technology-related topics: SOA, BPM, cloud computing, enterprise mobility…it’s a virtual technology funfest. Oh, and let’s not forget the Goo Goo Dolls, who will be playing Tuesday night. A few housekeeping details you might want to be cognizant of: First, check your bathroom for Bengali Tigers FIRST THING. Look, you can never be too careful, particularly in the wilds of Las Vegas. Second, go get your badge at registration. Unlike “Blazing Saddles,” at Impact 2012, you’re going to need your stinkin’ badge. You can find them on Level One of the Venetian Convention area. Third, plan your escape route NOW in the private confines of your hotel room. Err, I meant to say, your conference itinerary. I know, I know, most battle plans go out the window the moment you hit the battlefield, but it’s nice to have some general semblance of where you are and where you’re going to go next, even if it’s just a strawman. This year’s conference theme is “Change the Game: Innovate, Transform, Grow.” So, what are you waiting for? Get to it! As for me, I’m going to finish writing up some interview questions for ImpactTV (which starts tomorrow at 5 PM PST, 8 PM EST — check it out at www.livestream.com/ibmsoftware), then I’m going to head on down to the Pai Gow Poker tables. I’m feeling lucky! If you’re feeling lost, or even unlucky, just follow the #IBMImpact hashtag on Twitter — you’re sure to find plenty of others who are feeling just like you. And if you have a question for the event organizers, send that question on Twitter to the #AskImpact Twitter ID and surely someone will get you an answer and soon…ahem, it may not be the RIGHT answer, but social media operators ARE standing by. And most importantly, smile and enjoy yourself…you’re in Vegas, bay-bey, NOTHING could go wrong now! I’m from headquarters and I’m here to help. If you’re a business or technology leader trying to understand and keep up with the insane amount of change going on in our industry, my recommendation is you hop on a plane and head out to attend the IBM Impact 2012 Global Conference from April 29-May 4. No, it’s NOT “The Hangover,” thank goodness — neither part one nor part deux — but what it IS is an opportunity to mix it up with your peers and to hear from some of our industry’s key thought leaders. Let’s start with the keynotes: Author of the acclaimed Steve Jobs biography entitled Steve Jobs, as well as president and CEO of the Aspen Institute, Walter Isaacson, will be a featured speaker this year. Isaacson is a former correspondent and new media editor of Time magazine, who went on to serve as chairman and CEO of CNN from 2001-2003. “Chic Geek” and 2011 audience favorite Katie Linendoll will also be making a return engagement to Impact. Katie is going to be leading the day 2 general session, as well as moderating a “Women’s Panel” later that Tuesday afternoon (May 1). And if you’ve never heard from Jane McGonigal, creative director of Social Chocolate and a world-renowned designer of alternate reality games…well, prepare to have your mind blown. I’ve heard Jane at a couple of SXSW Interactives, and Jane’s view of the world is one you’ll want to look into. She’s also the author of the New York Times bestseller, Reality is Broken. And those are just the guest speakers. You’ll also hear from a powerhouse cadre of IBM experts and executives, starting with senior veep Steve Mills. Also in attendance: Rod Smith, our VP emerging technologies…Marie Wieck, GM of the AIM organization…Bridget van Kralingen, senior veep of IBM Global Business Services…Jerry Cuomo, IBM Fellow and WebSphere veep…and a host of others. But let’s not forget one of the most important aspects of Impact: The networking prowess of 9,000 tech and business leaders all under the same roof. You can get started in the conversation well ahead of the event by following and contributing to the Impact Social Media Aggregator, and onsite, by visiting the “Impact Social Playground,” a new social hub that will provide enhanced social networking facilities for all attendees, Tweeps, bloggers, analysts, media, and Business Partners. 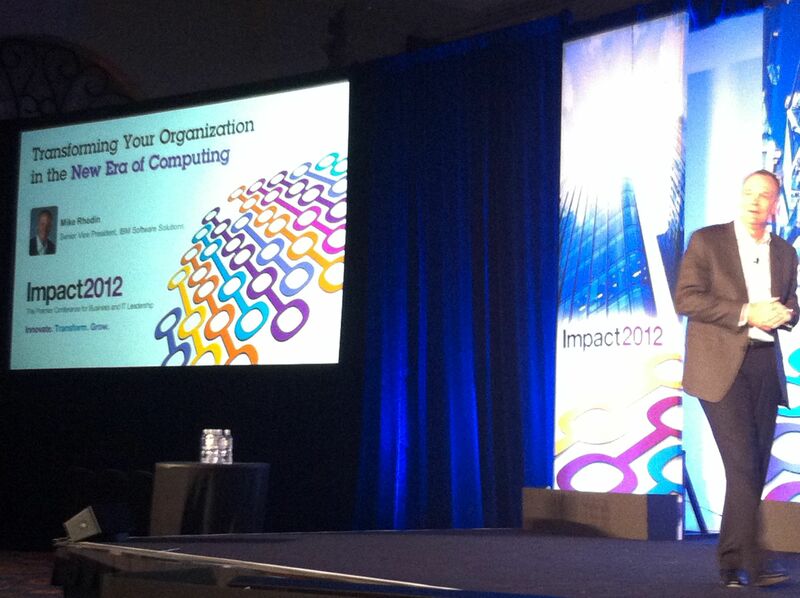 If you just want to follow along on Twitter, make sure you’re using the #IBMImpact hash tag. developerWorks blogger and podcaster extraordinaire, Scott Laningham, will also be in attendance, along with yours truly, where we will be conducting live and recorded interviews throughout the event for “ImpactTV.” So far, we have a committed lineup of the best and brightest…and then there’s Scott and I! Here’s the link where it all starts for Impact 2012. I, for one, can’t wait. Last year was my first Impact, and I had more fun and talked to more cool people than a person has a right to. And I learned more than I could keep in my head…but of course, that’s not saying much. I hope to see you there, and if you can’t make it live and in person, be sure to keep an eye on ImpactTV from April 29 through May 4. Oh yeah, did I forget to mention that the Goo Goo Dolls are playing??? It’s become self-evident the profound effect social media and networking have had on society and culture: The Arab Spring, the Japanese earthquake, the World Cup, even the tragic sinking of Costa Concordia over the weekend. What’s new, however, and has gone largely unnoticed, is how this shift is causing a ripple effect in the business world. Though many companies are focused on building out their own in-house social networks, the real opportunity will be for those who can gain real-time intelligence on the data being generated within those communities and to use that information to be more competitive in their markets. With more than 800 million Facebook users and 200 Million Tweets a day, the growing popularity of social networking has also created a social savvy workforce. 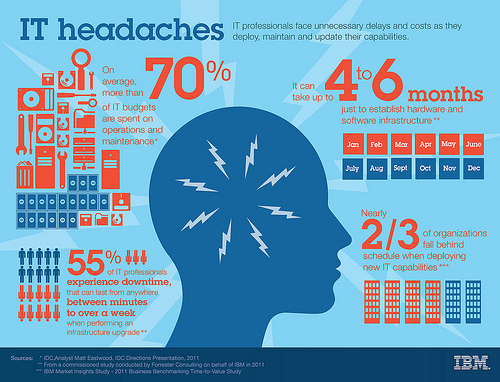 IBM’s 2011 CIO Survey of 3,000 global leaders indicated that more than 55% of companies identified social networking as having a strategic significance to their company’s growth. Forrester Research estimates that market opportunity for social software is expected to exceed $6 billion by 2016, an increase of 60% annually from 2010. This shift of consumer to business networking, also known as “social business,” has become the next big challenge for organizations who are looking to more quickly adopt these skills into their businesses to better reach clients and suppliers, while swiftly gaining insight on the data being created in these networks. The winners in this challenge will be able to react more swiftly to customer trends, and to out-innovate competitors. IBM is unveiling this week new social business software and services that bring together the power of analytics and flexible delivery models such as cloud computing and mobile devices. I had a friend who was recently impacted by one of those contaminated cantaloupes. Fortunately, she only got sick and didn’t perish from listeria, but 23 others were not so fortunate, and over 100 more also became very ill. These type of outbreaks cost $152 billion a year in the U.S. alone, with 48 million food-related illnesses and 3,000 deaths a year. Governments around the world are now proposing more stringent regulations to better protect consumers from food borne illnesses. A breakdown at any point in the food system on the farm-to-table spectrum can cause catastrophic harm to the health of consumers and great disruption and economic loss to the food industry. More than six billion cases of fruits and vegetables alone travel across the U.S. each year. As this food travels through various points of the supply chain there are possibilities of this food being exposed to temperatures or other factors that could lead to its contamination. In response to this challenge, IBM today announced that Cherry Central, a leading cooperative of hundreds of growers of fruits and vegetables in the United States, is using IBM analytics technology to provide true visibility of food items as it travels from the farm to supermarket shelves or ingredient buyers locations. Using analytics technology, the food producer and marketer has improved productivity by 50 percent. To ensure the safest food products reach the shelves of grocery stores and ingredient buyer locations, Cherry Central is collaborating with IBM and business partner N2N Global. With IBM analytics technology, Cherry Central is tracking data from the time fruit is harvested, sorted or processed, sent to a distribution warehouse, and finally unloaded and placed on display counters at a grocery store or ingredient buyer location. All of this activity data can now be collected, viewed, aggregated and analyzed in real time, all with a few clicks of a mouse. Additionally, workers now can use mobile devices to record key information, such as date, time, location, temperature, and all aspects of quality and food safety compliance. The information is uploaded to a centralized database, where it is stored and can be accessed and shared by their supply chain trading partners. Each time the food moves or is handled by someone new, the data can be updated thorough mobile devices, recorded and aggregated instantaneously to provide a complete, accurate picture within its operations. This, in turn, minimizes unnecessary administrative tasks and data entry, allowing management to focus more on business growth than data capturing. Cherry Central can now more precisely record incoming fruit from growers, track the food items through their operations and monitor and report on all critical control points such as refrigeration and processing temperatures, thus improving the overall traceability and visibility of the products they handle. These new capabilities are helping Cherry Central track food from harvest to dinner table to avoid contamination pitfalls. “Cherry Central and its trading partners are a microcosm of the entire food supply chain. In working IBM and N2N Global, we are taking advantage of a solution that tears down the barriers and complexity of the food supply chain,” said Steve Eiseler, vice president of operations at Cherry Central Cooperative. One of the major challenges for Cherry Central is to provide better transparency and usability of its data that is growing at the rate of 1.6 million records per month. Many in the food industry still use paper-based solutions that produce paper checklists and questionnaires to perform audits and inspections on their fruits and vegetables and processing/packing systems . As paper forms are returned to the office, they are “manually” entered into the computer leaving room for human error, generating mountains of paperwork and the possibility of misplacing files — making it more difficult to pinpoint the source of a possible contamination, causing costly and potentially critical delays. Now, with analytics technology, Cherry Central is not only capturing this data, but using analytics to create real business outcomes from it. For example, processing data can be analyzed real time and decisions can be made immediately rather than waiting hours or days until the data is compiled. In addition, all small businesses are impacted by federal regulations and government mandates. Small businesses operating in the food industry, however, have additional layers of regulations and mandates defined by federal and state agencies such as the United States Department of Agriculture and the Food and Drug Administration. The new Food Safety Modernization Act as well as industry trade association standards have added new and complex compliance demands to the landscape. Cherry Central’s business analytics platform provides product traceability consisting of IBM DB2 Web Query running on Power System. Its quality & food safety program runs on N2N Global’s Quality & Food Safety Manager solution running on IBM System x. If you’d like to learn more about IBM’s Smarter Food initiatives, visit here.